On the lookout for survival knives? Blade-Tech Industries focuses on what their customers need in blade technology. Blade-Tech Industries supply members of law enforcement and the armed forces as well as hunting enthusiasts and survival experts. The company is ever increasing their research and development. As an American manufacturer Blade-Tech Industries puts their country first and supplies only the best. With this in mind, here are three of Blade-Tech’s great survival knives. The RipTide by Blade-Tech Industries is a karambit style knife and rapidly deploys via a lever located on the back of the blade itself. This knife is also assisted by a kicker so the user can easily deploy the blade with the tip of the index finger. What is a karambit? 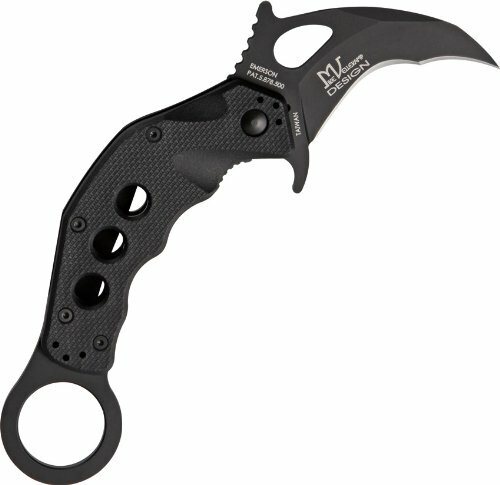 The karambit can be a blade or folding knife characterized by its curved blade, This knife is often used for close quarters combat. The belt clip is an ambidextrous belt clip allowing left-handed individuals all the same benefits as right-handed individuals. The finger well is smooth and not oversized, making the RipTide a great hunting and self-defense blade in cold weather while gloves are worn. For hunting, the RipTide blade is a great blade to have on hand for on-the-spot cutting. For self-defense, the RipTide by Blade-Tech Industries is a must have for everyday carry because of its rapid deployment for instant use. With an extremely sharp edge and fine point, the RipTide blade by Blade-Tech Industries is a great tool to have for everyday survival. Check out more of the RipTide blade by Blade-Tech Industries here! The Pro Hunter blade by Blade-Tech Industries is a trusted folding survival knife amongst seasoned hunters and professionals in the law enforcement and military communities. An ambidextrous clip allows for all individuals left or right hand dominant to have quick access in a moment’s notice to their blade. The Pro Hunter blade is an excellent choice for all hunters but still remains one of the most popular knives amongst members of the armed forces. From police to special forces the Pro Hunter blade by Blade-Tech Industries is more than reliable and a top pick for everyday carry. Check out more of the Pro Hunter blade by Blade-Tech Industries here! The Pro Hunter Jr., much similar to its counterpart the Pro Hunter, is a smaller version but still packs just as hard of a punch. The textured handle allows for increased grip for this E.D.C knife as well as both left and right-handed individuals will be satisfied by the Pro Hunter Jr. due to its ambidextrous clip. The blade itself features a Blade-Tech V-Hole which ensures a rapid deployment even while gloves are on. The Pro Hunter Jr. and the Pro Hunter are both designed by Tim Wegner founder of Blade-Tech Industries. By itself, the Pro Hunter Jr. blade by Blade-Tech Industries is an excellent hunting, everyday carry, and wilderness survival knife. The pocket clip allows the Pro Hunter Jr. to be attached to your belt for quicker reach. Designed with all the needs a hunter could ever ask while simultaneously exceeding the needs of members of the law enforcement community and armed forces branches, the Pro Hunter Jr. is one of the most trusted blades available on the market. There goes a few of the quality knives from Blade-Tech Industries. Whether you’re looking for tactical, survival, or hunting knives, Blade-Tech gives you the best knife options to choose from. Determine how you’re going to use the blade, then take your pick among these kickass survival knives. Do you own any of these knives from Blade-Tech Industries? Tell us about it in the comments section below! Knives and other Weapons (i.e. several firearms and a CCW permit) Give me enough protection for the streets. How about some fire starter kits and water purifiers, dehydrated food. Real survival gear. Penknife to assisted open, to, Big Ole Buck. Knive and the such are not what I personally want but the others i mentioned are much more useful. I went into the mountains for 3 days, nothing but ammo, fitearm,(44 mag.) And a gallon of water. Oh and my watch it is a Garmin equipped with GPS and compass. By the first morning most water was gone and i needed food. Thank goodness for my dog. He found a spring and if your quiet enough you can get food. Not squirrels a 44 leaves little left. Rabbit and some birds. I had a hunting license and notified the Rangers what I was doing and what direction I’d be in.. Water was my only problem, too heavy to carry. But I made it. I have several fixed blade from machete to several pocket knives…also.have a.gerber multitool as well as hoffman richter multi tool..dont.have guns but.i have a barnett crossbow…. I might like to order 1 of these knives however the last knives I order from Survival Life have not arrived yet. They were ordered in Dec 2018 it is now Feb. 2019. I guess I will never see them or my money either.